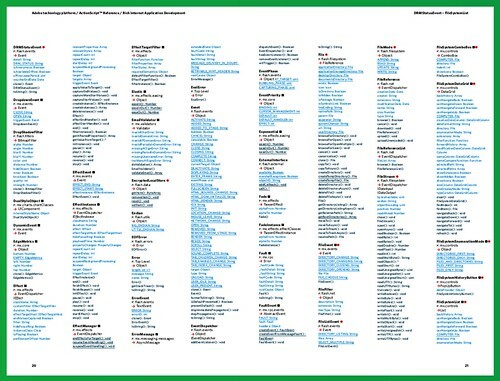 We have just released a PDF of a new reference guide that we have put together (with the help of frog design). 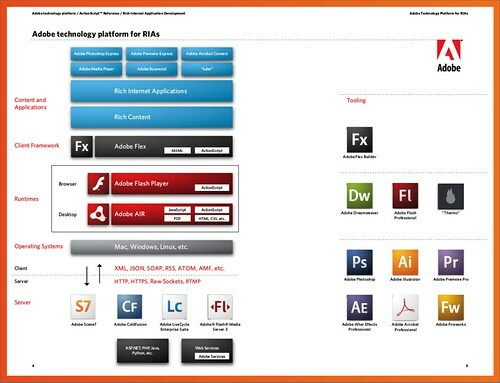 This title is the Adobe technology platform ActionScript reference for RIA development, and it provides a complete ActionScript 3 API listing for Flash Player, Adobe AIR and Flex 3. They are similar to the ActionScript 3 API posters, but intended to be a little more usable and portable. The guide is around 50 pages, and is meant to be printed out on comic book glossy stock. We will be printing some out over the next couple of months, so you may see be able to pick them up at various events and conferences. The entire work is released under a Creative Commons Attribution-Noncommercial 3.0 Unported License, so feel free to edit it, add to it and redistribute it. The document was created with Adobe InDesign, and I plan to post the source files in case anyone wants to update it, although I have to figure out what to do about the fonts used, as we don't have the rights to redistribute them. Any ideas? Finally, if you find any bugs, errors or omissions in the document, please post them in the comments for this post.